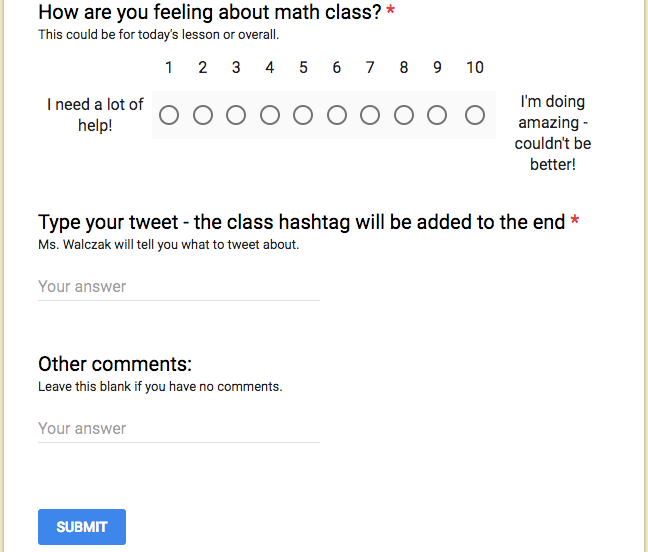 EDIT: Here is the Teacher Report Card Survey that I used. It was modeled after Matt Vaudrey’s Teacher Report Card and others that I’ve seen over the years, and adapted from my previous ones. Only 75 of my 105 students took my Teacher Report Card Survey. I’ll post a reflection later. How can Ms. Walczak improve her teaching for next year? What is something Ms. Walczak should keep doing next year? What is something Ms. Walczak should change for next year? What is something that’s memorable from this class? What is one word you would use to describe this class? What do you think the benefits to teh Daily Warm Ups were? What do you think the drawbacks to the Daily Warm Ups were? Je suis heureuse avec mes resultats! I ended my fifth year of school last Friday, but have been working this week with the other freshman teachers and math department chair to design an Algebra I curriculum (moving away from Integrated). So it feels like summer but then doesn’t. We’ve been doing some good work and it’s nice to just be able to chill and plan. This year was difficult but rewarding. I felt like there was never a chance to relax and breathe. First, I taught all new classes – Integrated Math I and Honors Integrated Math II. There were technically topics from both those classes that I had taught before, so it wasn’t all completely new. 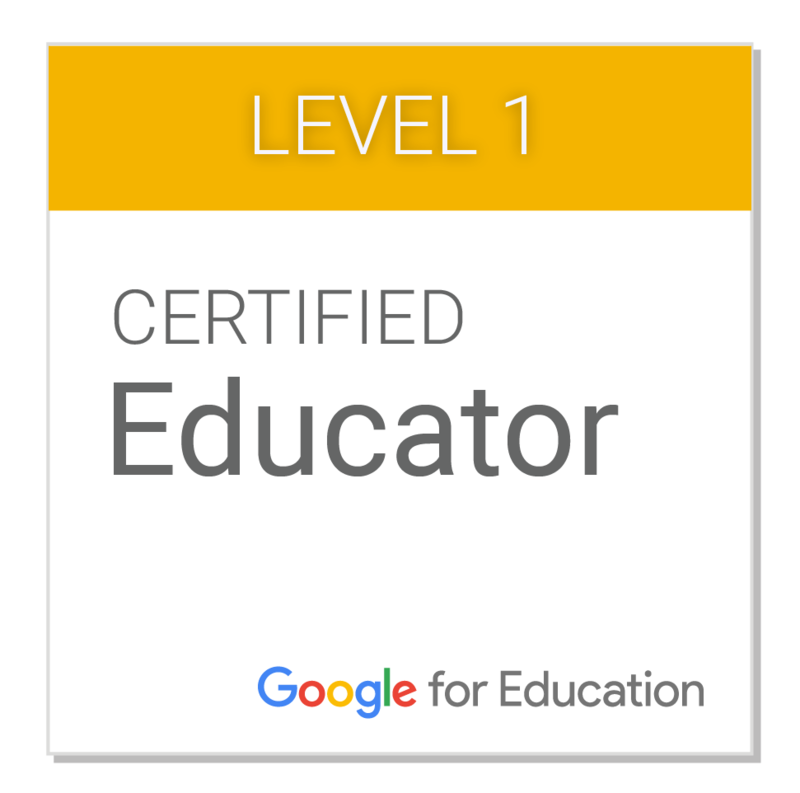 I taught the same classes as two great teachers that collaborated with me and we did some really cool things with our classes. I was also part of our Freshman Academy, which meant our students mostly all had the same core teachers and we had extra weekly team and monthly Academy meetings to attend. I presented at the NCTM Regional Conference in Chicago and also at the Western ICTM Math Conference, and also participated in training with the Literacy Design Collaborative (LDC). I tried to start a math club/team but it didn’t really last past February. I joined the Environmental Action Committee (EAC), which is our environmental club at school so that I can take it over for next year. I’m also going to be moving classrooms for next year so I’ve started that process. I’ll talk more about all that later. Personally, I was also pretty busy. I finished my master’s degree in Teacher Leadership from American College of Education in May. I’ve also been planning my wedding all year (done with that in July). That meant lots of weekends making the 3-hour drive to where the wedding is on pretty much any weekend that wasn’t filled with band. I’ve been continuing to be a Percussion Technician for my fiance’s band program and have been very involved in his band this year. I also started to tutor one of his students in Calculus and helped a few more of his students at random moments throughout the year. I did well for a little bit with working out and #FitBoS, and then fell off again – but I’m getting back at it now! I took my first bereavement days and coped with other health problems in my family, but am thankful that everyone is doing great now! I took a vacation to visit my brother in Washington D.C. I also learned to cook some more things after getting an Instant Pot for the holidays! Who has some good IP recipes to share? I also started a fruit/vegetable garden for the second time and have learned to take care of some plants. This school year has definitely led to a lot of adult-y growth. It’s weird to think about all the things I did. Over the school year, my mind always seems to be about what the students have done. I do not give regular daily homework in my classes, but instead, give what I call a Reflection after every assessment. 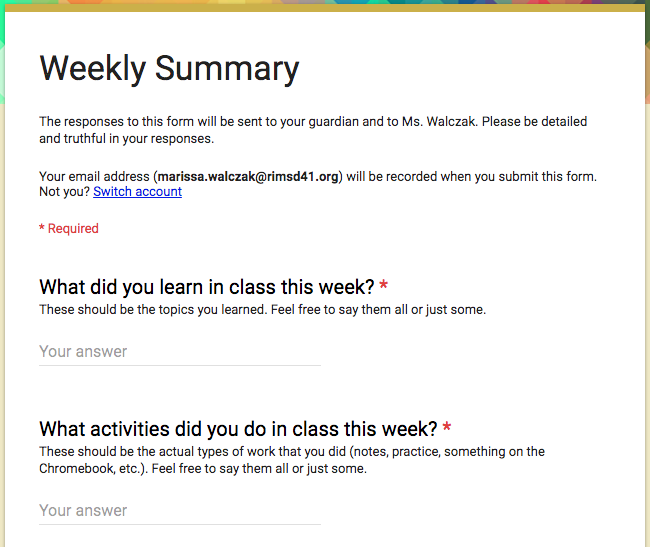 I give them a week to do it, and it’s always a 5-6 question assignment where they write their responses in a Google Doc and submit it through Google Classroom. The first 2-3 questions are related to the content that was just assessed. Usually, ones that take more thinking and are higher order, or sometimes I make a 3-Act in it, but it’s always something that makes them do more than the rote problems I have to give in the assessments. The last 2-3 questions are more of the typical reflection-type questions that are about the student. I did get plenty that listed math skills, but these examples just made my heart swell. Special thanks to Sara VanDerWerf @saravdwerf and her suggestion about the Scale of Persistence (https://saravanderwerf.com/2015/12/13/22-minutes-mindset-grit-and-trauma/). The beagle and people stuck on the escalator obviously made an impact. Ma classe a affecté mes étudiants avec plus des maths simplement. One way that I communicate with parents is by my Class Twitter (an idea I stole from Annie Forest). At the end of every week, I have students do a Weekly Summary. One of the prompts they have for that is to answer the “Tweet Question”. Guardians do not see these answers when they get the emails. That’s because I curate the tweets to put on our class Twitter. I usually use one tweet per period. 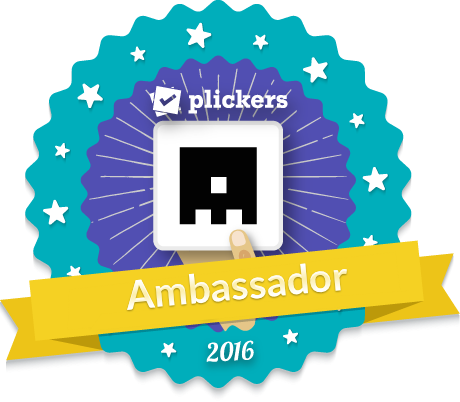 I have the Twitter feed on my class website and currently have 5 followers…but some students have said that they just look on my website. I also post pictures from class on the class Twitter. I haven’t gotten any parent comments about it yet. Honestly I don’t know if any look at it. I just keep putting reminders that it’s there when I send my unit emails and, if nothing else, it’s nice for me to chronicle the year. What is the most difficult part about ____? What is one piece of advice you’d give about ___? How can you use ____ in a real-life situation? What do you wish your teacher knew about you? What is your goal for next week? What is your favorite ____ and why? I try to get one per class to post but sometimes I do more. J’espère que les parents apprécient les mises à jour. Parent communication is hard. 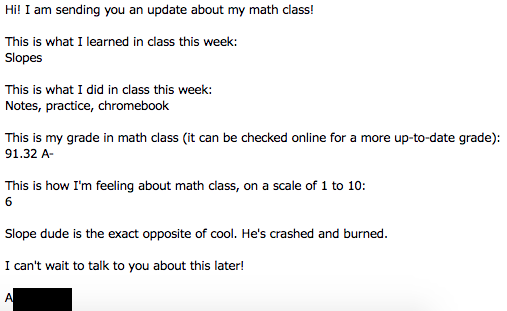 At the start of last year, my principal mentioned something his old school did where students texted their parents during the day with kind of a status update on how they’re doing in classes and what they’ve been doing. I took this idea and tried to do it daily but that was a little much, so I made it into a Weekly Summary. Students do these at the end of the week (mostly Fridays but sometimes Thursday if we have Friday off or something like that). Anything else they want to say. Also, the form will automatically pull the student’s grade to put in there (I have to copy it from my gradebook into my Class Roster spreadsheet that’s referenced in the directions below). Students were surprised the first time that it actually went to their parents (I guess my disclaimer at the top wasn’t convincing enough). Since I receive an email, I am able to check this and send additional notes to guardians if necessary. I use the responses, especially the ratings of how they’re feeling in class, to help me know who I need to talk to most and what I need to address. Teacher sharing for the win! So since this was a pretty important person that was requesting it, I spent some time making sure my directions were good. I will admit, they are pretty long and it will probably take at least 30 minutes to set up your first class, but after the setup, it just always works. I’ve never had an issue. Let me know if you have any questions or suggestions. I want to be in touch with families more. The Weekly Summaries helped, but I know it doesn’t reach everyone. The ones that don’t have an email, unfortunately, do not get a weekly update, so I try to call those families. Il faut communiquer avec les parents, mais c’est très difficile. I am teaching all freshmen this year! I have four sections of Integrated Math I and one section of Honors Integrated Math II. Because they’re all freshmen, they haven’t seen me do the activities I did before for the first days (unless their middle school teachers did them, but I’m gonna just assume not)! School started on Thursday for students. Also, many of the students’ schedules will change in the first five days of school for whatever reason, so I need to be more cautious than before about using things that I’ll reference later in the year and making sure I catch new students up better than before. I will also keep in mind that my first unit is on solving equations with the absolute first thing being distributive property. And, I’m gonna do the same activities in my Math I and Honors Math II class because I think the norms should be the same and they need to learn some of the same things about the class. I will be doing a lot of the same stuff from last year (semester 1 semester 2) because it actually went well! And by the time I’m posting this I’ve already had my first two days, so I included what actually happened after those days. Students can sit anywhere they want. Demonstrate how to make the Name Tent with pictures on the board and I make my own with them. Take attendance and mispronounce names but apologize profusely. Write down phonetic spellings on the roster. Reflection: This went really well! I actually planned out the timing pretty well (for like the first time ever). My honors class was the only one that had multiple groups actually try to work out solutions to show on the boards, but the beauty of VNPS is that if there’s one group that is doing it, eventually there’s 3 and then 5 and then all. We only had about 15-20 minutes to work through it, and many groups were convinced it was 2 or 4 seals, but that was also awesome because then I could alert them to a group that had a different opinion and they could debate it out. It also allowed me to see how students were 1) willing to try to do something and 2) using anything more than intuition to prove their answer. We will revisit this problem later in the year in both classes. As students walk in, they read the board and hopefully follow the directions to sit anywhere and have a writing utensil. Hand out the syllabus and go over it. In the middle of that we come up with classroom rules that I’ll put together from all my classes that night. They need to fill out an information sheet to turn in by the end of next week. For the class rules, what I did was I said “You guys have been in plenty of classes so far in your life, and you probably can think of some class rules that helped EVERY student be more successful. I want you to think for 30 seconds of at least one rule that you think should be in our class. After 30 seconds, you’ll have 2 minutes to talk with your table group to come up with 2 rules. Every group will then share one rule and we’ll see at the end if we need to go around again for more. (Then when they were ready to share) When each table shares, 1) I reserve the right to say no to any rule that’s unreasonable, or goes against school rules, and 2) we will open it up to the whole class to object to or adjust the rule. If a group said something like “Be respectful”, I’d ask them to clarify by telling us what that would look like. So we didn’t get to do Sara’s 1-100 Group activity that I had thought we would do. It’s ok, though, because I think this collaboration was really important. I was really impressed with the quality of their rules. You can see that one class tried to get a little more out of their rules, but I applaud them for knowing what they want. Website quest with a student survey and Central Park. Central Park may be too much for my Math I students but I’ll be interested in seeing how they approach it. Friday I’ll have to give my school’s Pre-Test for the classes. If any class ends early any day I’ll tempt them with Petals Around the Rose. You might be thinking “whoa Marissa, you are taking a lot of time before getting to start instruction! Aren’t you worried you’ll run out of time to teach?” Yes, I’m always worried I’ll run out of time to teach, but I also know from 4 years of experience that if you do good relationship-building activities in the beginning of the year/semester, it can end up saving you time in the end. For example, I started teaching the first lesson 3 days after my colleagues did last year when I taught Math II, and I ended up being able to spend more time on certain concepts in the end. Trust me, it works. So I’m not that worried. Also, I’m teaching all freshmen and I think they definitely need more transition time. A lot of them are visibly scared right now – we need to establish a safe learning space. Le départ de l’année est très important pour les étudiants et moi.